Scooby Doo is one of the most loveable canines in animation history, and starred in one of televisions longest running cartoon series. 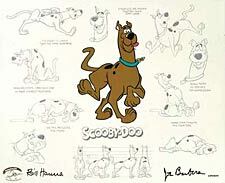 Based on actual Scooby Doo artwork, this edition recreates Scooby’s classic model sheet poses. This fabulous Limited Edition Cel is based on artwork created by small screen legends Bill Hanna and Joe Barbera, and artist Iwao Takamoto who created Scooby. Each work of art is signed by Hanna and Barbera.